This 1972 Chevrolet Impala Custom Coupe is an example of one of the two different 2-door hardtop rooflines available in the full-sized Chevy line 45 years ago. Yes, sales were so brisk back in the day that they offered more choices than you could shake a stick at. The Custom Coupe was the more formal-looking version of the Impala two-door hardtop; it was also used on the upper-crust Caprice Coupe. 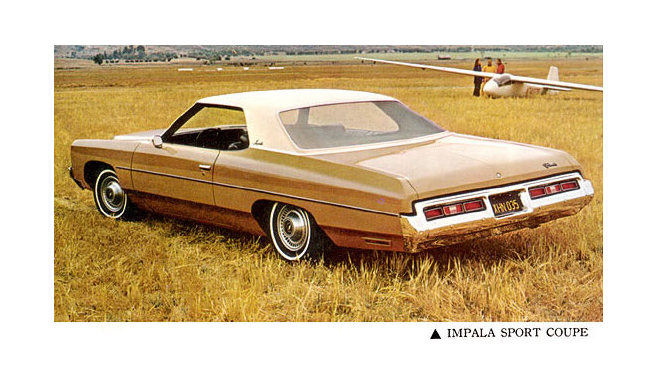 A more sporty-looking roofline, available only on the Impala, was the Sport Coupe version (bottom). Found this gold example last summer in Brockton.